A digital piano packed with performance features. The Suzuki CTP-88 might as well be described as a computer with keys. The level of technology packed into the compact, yet beautiful wood grain cabinet is nothing short of amazing. As a learning tool at home or in the classroom, nothing compares in it price category. As an entertainment center in your living room, you can create, listen, store and compose. A beautiful matching bench is available separately. Technically speaking, the CTP-88 has enhanced performance features not found on any Digital Piano in its price range. A full compliment of hi-tech features allow for endless musical possibilities. With blue tooth compatibility, you can access music, lessons and demonstrations from the internet any way you choose. A true full color LCD control screen makes it easier to organize your selected features. 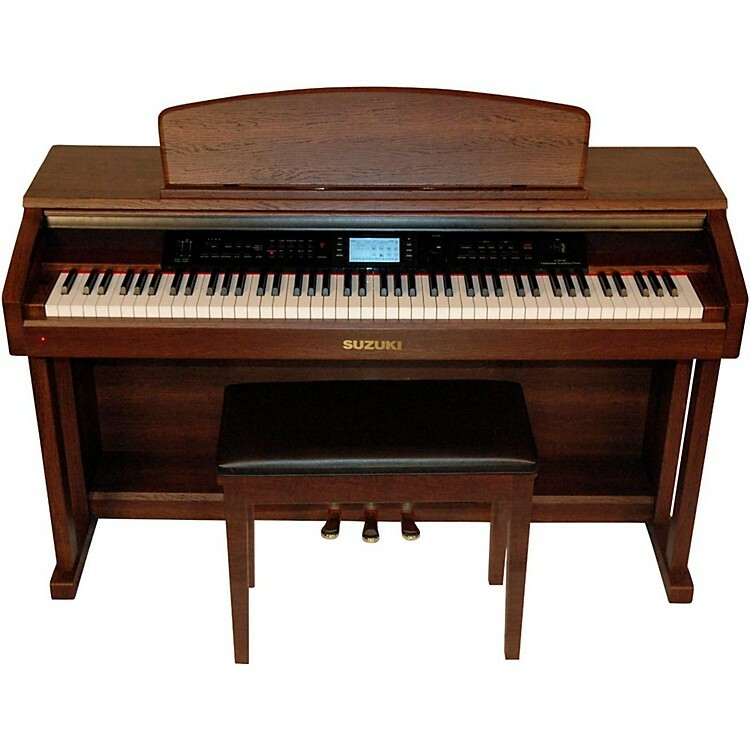 Only the most advanced synthesizers boast 128 note polyphony for incredible full bodied sound. The CTP-88 includes this advanced feature. The piano voice is an amazing 24Mb of powerful sound reproduction played through an acoustically design 4 way stereo sound system. Create your own original compositions with the on-board 3 track music sequencer. Save and store to the Secure Digital(SD) Memory Card. Suzuki's acclaimed sound imaging technology and 24 Mb piano sound are used to create remarkable depth, expression and realism. Instrument voices use 3D sound source sampling for incredible dynamic response. The CTP-88 features an acoustically designed 4 way stereo sound system. High grade speakers and integrated tuned cabinet deliver a truly dynamic sound, rich with presence and power. As a tech titan, the CTP-88 includes the latest Bluetooth technology. Wireless networking enables any wireless device to connect to your CTP-88 Digital Piano for expanded and convenient operation. Connect the CTP-88 to your iPad and convert it into a recording studio! Makes practice and playing time a lot more fun. If you have kids, it might make all the difference in encouraging them to practice! The CTP-88 has a USB port that opens a world of exciting add-ons and extra functionality. Plug and Play directly with your laptop or desktop computers. Or you can use the MIDI ports to transmit and receive data from other musical instruments or computer accessories. Secure Digital (SD) Memory Card lets you record your performance or playback hours of prerecorded music files. Create your own music library with songs you download from the internet using the included SD Memory Card. 128 note polyphony ensures no dropped notes even with the most complex piano passages. Digital signal processing (reverb, chorus and EQ) allows you to sound sculpt your performance to your personal style and taste. The layer and split piano functions with sound balance controls guarantee beautiful, rich, full sounding instrumentation. Multi-track music recorder allows the beginner or performing musician to monitor daily progress. The CTP-88 has a large 4.3 inch LCD display screen in full color to help organize your selected features. Find what you need quickly and easily with this large window format. An amazing combination of 128 MIDI voices, 100 rhythm styles and recording features create endless musical possibilities. Professional styles make you a member of the world class band of your choice. Rock to Bach, World Beat to Jazz ensembles, Boogie Woogie to New Age, your musical spectrum is limitless. Choose from 55 preset songs for instant playing with the included songbook. Simple to advanced songs allow for separate practice with the left hand or right hand or play along with both hands. Engage the vocal grading feature for a true to form "piano teacher" response. The CTP-88 has a velocity sensitive, graded hammer action keyboard that offers superb response and smooth feel.